The end of daylight savings, or Summer Time, came suddenly and mercilessly. One week I was coming home after work to a beach full of swimmers and sunbathers (bakers in the local vernacular). The next week I am returning in the dark. There’s still plenty of activity on the Esplanade: runners, cyclists, saunterers, dog walkers, and though it’s not cold yet, it is definitely Autumn. 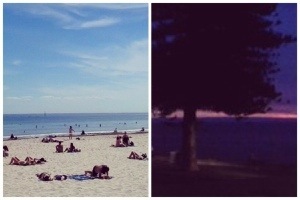 The beach when I get home from work- last week and this week. You can’t escape the fact of time – Aussie day is European night- as it governs inter-hemispheric communications. I wake to email replies from the UK to yesterday’s questions. The seasons of course are reversed, and although I understand that in theory, I don’t yet know what the individual months mean here. I swam at the weekend. That’s the equivalent of swimming in the UK in October. But the weirdest thing is the half hour time zone. South Australia and Northern Territory time is thirty minutes behind Sydney and Melbourne. To make things totally confusing, Queensland, Western Australia and Northern Territory do not have daylight saving at all. How can I possibly know what time it is in London, when I can’t even work out what time it is in Australia? The times they are a- changing, indeed.